Interest in drug trafficking in Africa has typically focused on cocaine in West Africa. The region is home to what many have labelled Africa’s first narco-state, Guinea-Bissau. But since 2010, an increase in heroin trafficking in and around East Africa has demanded the attention of the international community, which has warned that the effects of large-scale heroin trafficking could be devastating for the region. By CARINA BRUWER. With the exception of Somalia, East Africa is considered relatively stable. With political figures often linked to drug trafficking and other forms of organised crime, East Africa is particularly vulnerable to the potentially devastating effects of heroin trafficking, and a rapid and innovative response to the growing trade is needed. A series of United Nations Office on Drugs and Crime (UNODC) reports, including the 2015 World Drug Report, 2015 Afghan Opiate trafficking through the Southern Route report and the 2016 report entitled The Afghan Opiate Trade and Africa – a Baseline Assessment, have highlighted East Africa’s increasing importance as a transit point for Afghan heroin. The drugs are being trafficked along what is known as the “southern route” or “smack track”, a network of routes stretching from Afghanistan through Pakistan and Iran, across the Indian Ocean to East Africa and eventually to consumer markets on the other side of the globe. The route’s recent expansion has been attributed to conflicts and increased law enforcement activity along traditional trafficking routes, pushing trafficking flows south. The southern route relies primarily on maritime trafficking to get large heroin shipments to consumers in Asia, Africa, Europe and North America. Maritime law enforcement is considerably more difficult than land-based enforcement, a fact traffickers use to their advantage. Other regional conditions which favour traffickers include the location along the southern route, porous borders where drugs can cross undetected, weak law enforcement and maritime surveillance capacity, socio-economic circumstances encouraging participation in trafficking as a means of income, corrupt officials, ineffective criminal justice systems to prosecute perpetrators, and a lack of regional and cross-border co-operation. With limited resources and a lack of anti-trafficking expertise, regional law enforcement and maritime forces are struggling to prevent the growing amount of drugs being trafficked through their waters. International naval patrols, such as the Combined Maritime Forces, have therefore been the most successful response to the surge in trafficking, seizing various heroin shipments on the Indian Ocean. The Combined Maritime Forces is a multination naval partnership deploying ships to patrol the Indian Ocean. Initially deployed to combat Somali piracy, these vessels have shifted their attention to drug trafficking and other maritime crimes since piracy’s decline. In 2013, it was reported that 22 tons of heroin pass through East Africa annually, the majority of which is destined for onward shipment. This is five times the 2009 estimate for the region, but since 2010, bigger and more frequent seizures have been made. A single seizure in 2015 netted more than 1.5 tonnes of heroin, making it one of the largest ever heroin seizures outside of Afghanistan, Pakistan or Iran. Heroin trafficked through the region is most commonly hidden on dhows, but ships, ferries and yachts have also been used. Authorities have struggled to prove trafficking in shipping containers, but because other illicit commodities such as ivory are often seized from containers, it is assumed that heroin is probably passing through ports undetected, too. While illicit commodities such as ivory tusks can be detected by their shape during security scans, heroin will be a lot more difficult to detect. According to the UNODC, after making its way from Afghanistan to Pakistan and Iran, heroin shipments generally leave from the Makran coast, which stretches along the coastline of Iran and Pakistan, to a range of entry points in East Africa. While large ports such as those of Mombasa and Dar Es Salaam are popular destinations, most dhows reportedly do not enter regional ports but remain out at sea. If dhows do dock they do so in smaller island ports off the coast. Some shipments sail as far as South Africa and Mozambique or are transported there overland from East Africa. South Africa has the infrastructure, financial services and connections to the global economy to facilitate onward shipment to destinations beyond Africa. In two recent busts of heroin coming from Mozambique to South Africa, two traffickers were caught in separate incidents, both transporting heroin worth over R50-million. While most heroin passes through East Africa on its way to other destinations, there has been a sharp increase in regional consumption in coastal areas such as Zanzibar, Dar Es Salaam, Mombasa, the Seychelles and Mauritius. Although there is little data on the status of East African heroin consumption, the UNODC estimates that residents of the region consume at least 2.5 tonnes of heroin annually, with most of the region’s users found in Tanzania. Repressive drug policies in East African countries probably nurture the growth of these numbers, criminalising users in need of treatment, rather than helping them fight their health-eroding addictions. Such policies neglect harm-reduction, HIV-related risks and drug demand. However, some harm reduction programmes are emerging in the region, with Tanzania’s methadone programme a good example of a harm-reducing response to drug use. Kenya is also slowly seeing more methadone programmes emerge. The UNODC and other NGOs also support harm reduction strategies in East Africa. East African countries face many challenges including natural disasters such as the recent drought, conflicts and terrorism in the form of al-Shabaab. The recent surge in heroin trafficking and consumption may contribute to further violence, insecurity and other forms of organised crime, all of which undermine regional development, security and the rule of law. Various reports, such as Peter Gastrow’s Termites at work: Transnational Organised Crime and State Erosion in Kenya, have documented corruption in the region which, when coupled with an inability to respond to the trafficking threat, can threaten state institutions even further. In Transparency International’s 2015 Corruption Perceptions Index, all East African countries bordering the Indian Ocean are ranked in the bottom 56 out of 168 countries, with Kenya ranking the highest after Somalia. Ministers to influential businessman have been implicated in drug trafficking in the region and it has been reported that in Kenya, Tanzania and Mozambique, criminal gangs connected to political and security elites control heroin trans-shipments. East African countries and the international community have yet to disrupt these practices. Despite calls for intensive research and data collection, little more is known about this illicit market today than was known when the increase in trafficking was identified in 2010. Better data is needed on purity, local use, seizures and how and via which routes heroin is trafficked upon reaching the region’s shores. A severe lack of data, or available data coming from unreliable sources, has meant that establishing the true impact and extent of heroin trafficking in the region and effectively responding thereto is impossible. The scarcity of data has been attributed to weak regional law enforcement and insufficient data and intelligence gathering abilities. National governments therefore need to prioritise reliable data collection in order to be able to form a realistic image of the region’s heroin trafficking problem. Investigations into individuals implicated in trafficking, especially those with political links, is vital in order to dissect the trafficking networks. While harm reduction programmes could address local heroin use, law enforcement efforts should instead be focused on criminal networks, especially those leading them. Little is known about these individuals as most drug-related arrests have been of low level traffickers who may lack knowledge of overarching structures and processes. Such people are easily replaceable and their arrest will not cause the criminal network’s activities to seize. Profiling these criminal networks and gathering intelligence on how the southern route is financed is important in order to get to the networks’ core. Commitment from East African governments to investigate these networks will also harbour trust from the international community due to allegations of corruption and government involvement in these networks. Intelligence should seek to shed light on these criminal networks’ structures, links to international drug markets and their involvement with other forms of organized crime. Gaining knowledge about organised criminal networks is exceptionally difficult due to their clandestine nature and the regional use of informal value transfer systems, such as hawala, poses further challenges to law enforcers trying to trace the origin of drug trafficking profits. A regionally-led international response is essential, with political will being the only true weapon against the surge in trafficking. Most important, alleged corrupt officials should be investigated and prosecuted to avoid state capture by drug traffickers. Heroin trafficking is a transnational crime and links developed and developing countries from all over the world. Seizures are often made in international waters, thereby further necessitating international cooperation. Regional and international co-operation and intelligence sharing are therefore vital in order to expose the heroin trafficking market and to provide a measure of accountability to domestic law enforcement and judicial officials. The global counterpiracy response is the best example of a well co-ordinated international response tailored to a specific regional problem and one which can in many respects be applied to drug trafficking and other maritime crimes. The UNODC’s Counter Piracy Programme has now morphed into the Global Maritime Crime Programme and works towards improving regional law enforcement, criminal justice capacity and co-operation, all necessary to locate and seize drug shipments, as well as to crack down on trafficking networks. Regional capacity building efforts should focus on strengthening law enforcement and maritime capabilities, especially in areas where traffickers are operating, such as ports and border crossings. International intelligence sharing can be assigned to the various information-sharing centres which were established as counterpiracy measures. East Africa already houses two of these which were established by the Djibouti Code of Conduct, in Mombasa and Dar Es Salaam. Carina Bruwer is PhD candidate, Centre of Criminology, University of Cape Town. 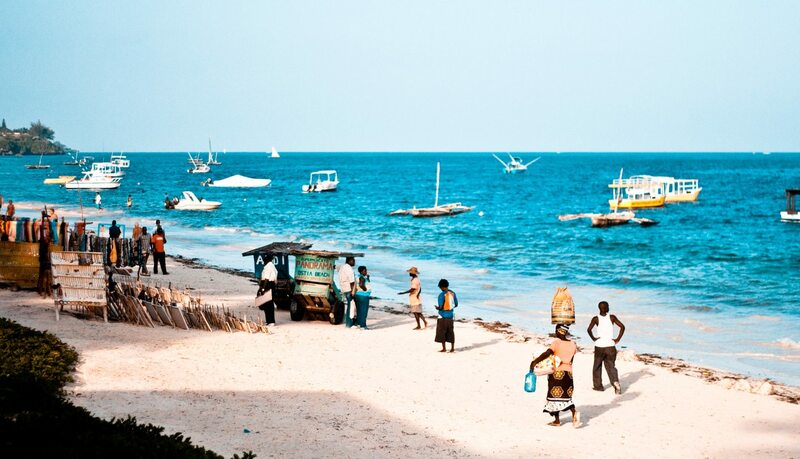 Photo: Mombasa by Thom Chandler via Flickr.